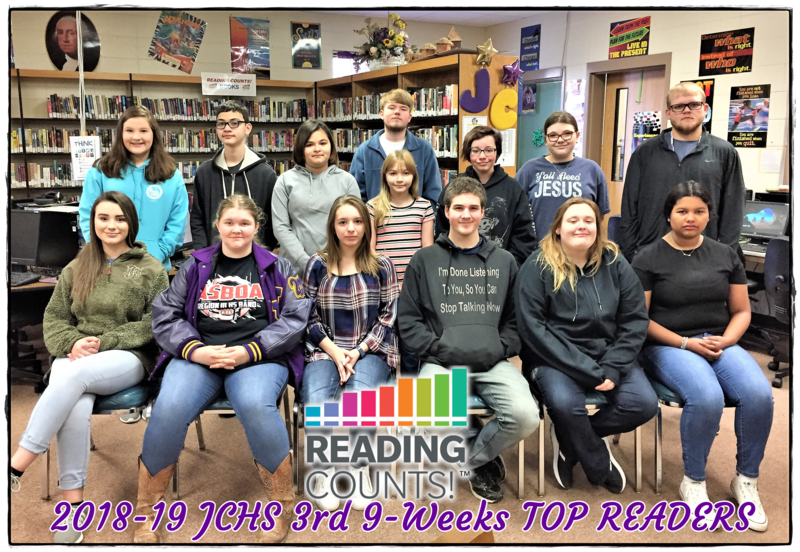 JCHS students are involved in a school-wide reading program. Students choose designated books from the school library. After reading a book, students take a comprehension test on the computer using “Scholastic Reading Counts!” Students who earn a 70% or high score on the test will earn a predetermined point value from completing the book. Students who score below 70% are allowed to retest on the book ONE TIME after the 24-hour waiting period. The following list shows the point requirements for each grade. Honors or AP English classes may require more points. Students are required to earn half of the semester point requirements per nine weeks. Only points above the required totals will carry over into the next nine weeks. Students are required to take tests over the novels they are reading in class. Reading Counts scores will count for one test grade of each student’s English grade per nine weeks. This will be tabulated by calculating the percentage of points accrued toward the required points. For example, if a 12th grader earns 20 points of the 25 points required for the 1st nine weeks, he or she would earn 80% for the one test grade in English. Books should be read completely before testing in the library. Each student must read within his or her Lexile reading range the majority of the time. Daily reading must be recorded in the reading log. *Fridays – Open to all students subject to availability of computers.